My Rules is where end-users can create different rules to forward, reject, or accept certain calls based on the phone number or the person calling and/or the time of day and day of the week when the calls are received. You can also add Schedules that determine when your rules are active. It’s recommended to add your Schedule, or Schedules, before creating any rules. How do I configure Selective Call Forwarding in My Rules? How do I configure Call Notify Settings in My Rules? How do I create rules for Time Schedules? How do I add new rules? A. How do I configure Selective Call Forwarding in My Rules? The Selective Call Forwarding feature allows you to create a rule to forward calls based on a pre-configured rule. From the My Phone home page, click the My Rules tab. Click the Active box to activate the service. Check the Ring Reminder box. This which plays a short tone on your Business Digital Voice IP Phone when a call is forwarded. Next, enter the Default Forward to number. This is the phone number that calls will forward to unless otherwise specified in the rule. Please Note: For Selective Call Forwarding to begin, you must create a rule, and optionally a Time Schedule. View the “How to I add new rules?” section to learn how to add a rule. Please Note: The Simultaneous Ring and Office Anywhere (Anywhere) features cannot be enabled at the same time. When you enable Sim Ring you will automatically disable the Anywhere feature and vice versa. B. How do I configure Call Notify settings in My Rules? The Call Notify feature allows you to receive Email Notifications when you receive calls from specific numbers. From the My Rules tab, select Call Notify from the drop-down menu. Then, enter the Email address where you would like to receive the Notifications and click the Save Button. Next, click the Plus (+) sign to add the rule. 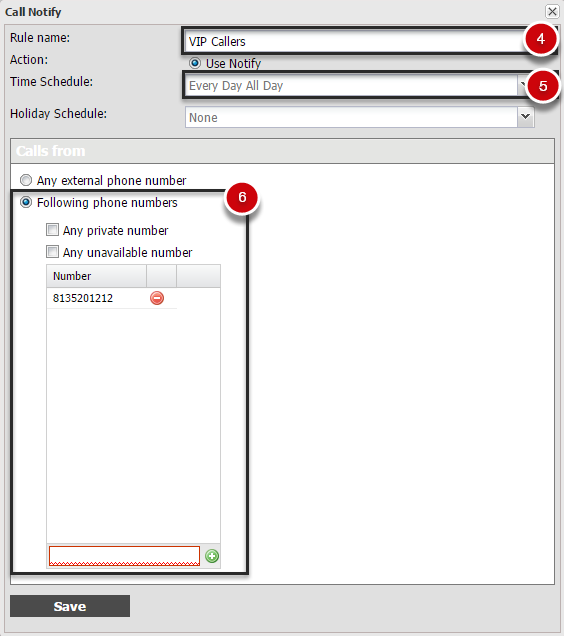 Enter the name of the rule, like “VIP Callers”, for example. If applicable, select a Time Schedule. This will notify you only during the times configured within the Schedule. To be notified all day, every day do not select a Time Schedule. Finally, identify which callers to whom you would like to apply this rule. To add specific numbers, select Following Phone Numbers, then enter the phone number and click the Plus (+) Sign. When you are finished adding phone numbers, click the Save Button. You will see this rule displayed in the list of active rules. C.	How do I create rules for Time Schedules? If you create a rule that is dependent on a particular Time Schedule, such as time of day or day of the week, first create your Schedule. Schedules are comprised of Events. For example, a “Monday Through Friday” Schedule would have Events for Monday, Tuesday, Wednesday, Thursday, and Friday. Enter the name of your schedule. For example, if you want to forward all calls received on your business number after 6:00 pm on Monday through Friday to your mobile number, you could use the schedule name of My After-Hours. Select Time from the drop-down menu. Click the Plus (+) sign to begin adding Events to the Schedule. Please Note: To add an After-Hours schedule, you will need to have two events for each day – one labeled “early” that would represent the time between midnight and when you arrive at work, and the other “late” that would represent the time from which you leave the office until 11:59pm that day. For this example, let’s name the first Event “Monday_Before Work”. 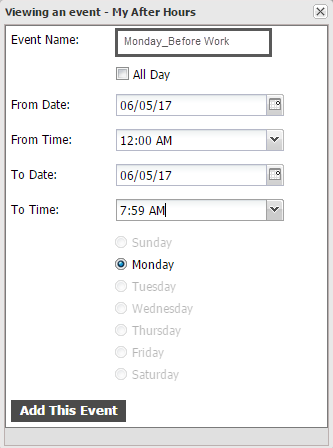 Select a From Date as the current day or a future date. Enter 12:00am as the From Time and enter 7:59 am as the End Time. Then click the Add This Event Button. Next, add an event named “Monday_After Work” Event. This would represent the time from after 6pm on Monday until midnight. Then enter 6:01pm as the From Time and enter 11:59pm as the End Time. Repeat creating a “Before Work” and “After Work” schedule for each day. D.	How do I add new Rules? Click the My Rules tab. 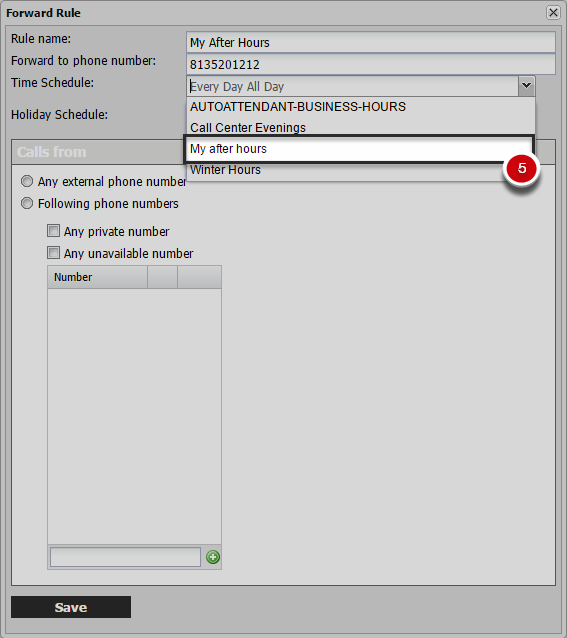 In this example, let’s create a new rule for forwarding calls – Select Forward Calls from the drop-down menu. Then, select the Plus (+) button. Enter a description for the rule, for instance, “My After Hours”. Please Note: A rule can have “All Day Every Day” as the default Time Schedule. Enter the forward to number in the Forward to phone number field. Then, select a schedule from the drop-down menu. Let’s select My after hours that we previously created. Any external phone number – which applies to any external call places to your number. Following numbers – which applies to only the phone numbers you have added in the number field. Click the Plus (+) to add the phone numbers. Any private number – which applies to calls from an unidentified number. Any unavailable numbers – which applies to calls that do not have an identified caller ID and are presented as unavailable. Click Save to save your rule. You will see the rule displayed in the list of active rules.